Paris is the final volume in Emile Zola’s trilogy Les Trois Villes, or The Three Cities. The trilogy follows Abbé Pierre Froment as he struggles to reconcile his rational, skeptical mind with his spiritual duties as a priest. In the two preceding volumes, Lourdes and Rome, Pierre suffered serious blows to his deepest held beliefs and has all but lost his faith entirely. Nevertheless, he continues to go through the motions of a saintly clergyman, practicing his profession by saying mass and tending to his flock. One aspect of his vocation keeps him going and gives meaning to his life: the exercise of charity. Through caring for the poor he feels that he can truly make a difference in the world. The more he interacts with the destitute citizens who inhabit the underbelly of Paris, however, the more he begins to wonder if charity is enough. How long will the hungry, down-trodden masses continue to swallow the Christian doctrine that they will be rewarded for their miserable lives with an afterlife spent in paradise? In the city of Paris, where income disparity is relentlessly increasing, how long will it be before the poor rise up against their oppressors and demand justice? Though the primary focus of the Three Cities trilogy is religious matters, Paris differs from the previous two volumes in that it delves more deeply into political and social issues. Zola depicts the city of Paris as a rational, atheistic alternative to religious centers like Lourdes and Rome. Paris is the global center of science and reason, a city destined to become the capital of the modern world, while archaic holy cities like Rome are fated to decline and decay into dust. Yet the Church still hopes to conquer this pagan metropolis. On a hill overlooking the great city, the Basilica of Sacré-Coeur is being erected, a temple of superstition and a declaration of war against this scientific stronghold. Though Zola sees Paris as the future salvation of rational mankind, the city has yet to complete its inevitable evolution, and in its present state it hardly qualifies as a Utopia. Zola vividly illuminates all the city’s social ills: corrupt politicians, an impotent and ineffective government, unethical businessmen, a biased and mercenary press, an immoral bourgeoisie, and a starving labor class that must resort to drastic measures to survive. In addition, anarchism is rising in Paris, and gives rise to acts of terrorism. Though this novel was originally published in 1898, the spectre of World War I looms over the story like an imminent, foregone conclusion. Despite all the gloom and doom, the overall message of the book is ultimately a positive one. That is, of course, for those who sympathize with Zola’s antireligious views. Paris features a large ensemble cast of characters and numerous intertwining story lines. Like the literary maestro that he is, Zola deftly conducts the various plots, punctuating them with moments of suspense and uniting them all in the end for a climactic, dramatic crescendo. The first two books in the Three Cities trilogy are fine, but nothing awe-inspiring. Paris, on the other hand, represents a return to form on the part of Zola to the glory days of the Rougon-Macquart cycle. Though it may not be equal to such masterpieces as Germinal or La Terre, Paris certainly deserves its slot on the shelf next to Zola’s greatest novels. The biggest drawback to the book, and the trilogy in general, is length. These are giant books packed with big ideas, and they in no way can be considered light reading. When all is said and done, however, it is worth the investment of time and energy in reading Lourdes and Rome just to experience how the trilogy culminates in this excellent finale. Fans of Zola will find their efforts handsomely rewarded. I first came upon this volume 25 years ago. It was my introduction to London, and today it is probably still the most valued book on my shelves. Jack London is one of America’s greatest writers, and this collection from the Library of America proves it. Though now best known for The Call of the Wild and other adventure tales of the Klondike (LOA also has a collection of those), in his day London was also a renowned writer on political, philosophical, and social issues. The five books and four essays collected here represent some of his greatest work. In addition to these book-length works, London wrote dozens of short stories and essays on political and social themes. The selection provided here is satisfactory, but not exceptional. It would have been great if they had included some of his short fiction like “The Apostate” or “Goliah,” but instead they have chosen four essays. “How I Became a Socialist” is an obvious choice, given its title and subject matter, but it’s really too brief to provide a great deal of insight into London’s political thought. “The Scab” is a very good example of London’s political essays detailing the failures of capitalist society. More perplexing is the inclusion of London’s “Introduction to The Jungle”, since it’s mostly just a plot summary of Upton Sinclair’s novel. “Revolution,” on the other hand, is an excellent choice. It’s a state-of-the-union address for socialism in 1905, and a stirring call to arms. The Library of America produces the best books of classic literature available today, with beautiful typography, high quality paper, and elegant bindings made to last forever. These volumes are not needlessly encumbered with introductions and prefaces, but let the authors’ masterworks speak for themselves. They do include endnotes which clarify historical events and archaic terms, and a detailed chronology of the author’s life. These books are truly a joy to read and to behold. My only complaint about the LOA is why only two volumes on London? He is America’s most widely read author worldwide, and deserves the extensive treatment given to Faulkner, Steinbeck, and Twain. Katherine Anne Porter was one of the best American writers of short stories between the World Wars. Though she achieved her fame through fiction, and rightfully so, she also published a great deal of journalistic essays, literary criticism, and brief memoirs. This volume from the Library of America, the most complete one-volume collection of her work, includes roughly 500 pages of fiction and 500 pages of nonfiction. Porter published three collections of short stories during her career, all of which are included here. The first collection, Flowering Judas and Other Stories, is also the best. It consists of twelve stories, most of which take place in Mexico, where Porter lived for several years. Among the standouts in this group are the excellent title piece, “Maria Concepción,” “The Cracked Looking Glass,” and “He.” The second volume included here, Pale Horse, Pale Rider: Three Short Novels, is also very good. It contains the excellent novella “Noon Wine,” possibly Porter’s best piece of work, in which a tragic event takes place on a farm in southern Texas. The third volume of short fiction included here, The Leaning Tower and Other Stories, is weaker than the other two, with the only real standout piece being “A Day's Work.” The overall impression given by Porter’s fiction is that she is a first-class writer, but she doesn’t hit it out of the park every time. She likes to experiment with style and structure, striving to push the envelope with each story. Even when she fails in her experiments, one can appreciate the inkling of genius in her failures. Her nonfiction, on the other hand, does not inspire the same degree of admiration. The numerous essays in this volume are divided into three main categories: Criticism, Personal and Particular, and Mexican. The Criticism section, which covers a who’s who of modern authors, is painful to get through. Her style could charitably be called impressionistic, but for the most part these pieces are rambling and disjointed. She’s far more interested in crafting a clever turn of phrase than she is in educating her audience about the book or author in question. The second section, Personal and Particular, is a mixed bag of writing about writing, autobiographical stories, and miscellaneous journalism and criticism. Porter doesn’t have anything particularly interesting to say about the writer’s craft. She proclaims no allegiance to any school, but advocates originality and creativity in general, praising the likes of James Joyce and Virginia Woolf. The best piece in this section is “The Never-Ending Wrong,” about the trial of the anarchists Sacco and Vanzetti. Porter took part in the protests against their unjust trial and execution. The third section, Mexican, I enjoyed much more than the rest of the nonfiction, simply because I happen to have a personal interest in Mexican history and culture. Porter shows herself very knowledgeable in Mexican culture and politics, and has a knack for vividly capturing the atmosphere and mind set of the nation and its people. Usually I praise the editing of the Library of America books, but here the editorial strategy seems to be to throw in everything she ever wrote, with the notable exception of her only published novel, Ship of Fools, which would have been preferable to most of the nonfiction included here. Like all books in the Library of America series, this one provides an extensively detailed chronology of the author’s life, which reveals far more about Porter than her own autobiographical writings. Porter was an excellent writer, so you really can’t go wrong in buying this book, but I must admit that I expected to like it much more than I did. Even Porter admits that much of her nonfiction was written out of financial necessity. It’s a shame she didn’t have the means or the time to leave us with more of her superb fiction. Frank Norris could have been a household name, remembered by all as one of America’s greatest writers, had he not met with an untimely death at the age of 32. Stylistically, he was an outspoken advocate of naturalism, a literary movement founded by the French writer Emile Zola. Naturalism is generally considered a form of realism because the author seeks to reproduce the world in all its gritty, scientific authenticity. Norris argued, however, that naturalism was a form of romanticism because often, as in the works of Zola, extraordinary events take place within this ordinary reality. This excellent collection of Norris’s writings not only presents brilliant examples of his naturalistic fiction, but also a number of valuable nonfiction pieces which encapsulate his literary philosophy. Three complete novels and an assortment of essays are included here. Of the novels, The Octopus is Norris’s best and most renowned work. Based on the Mussel Slough Tragedy of 1880, it tells the story of California wheat farmers struggling to defend their land and livelihood against the oppressive tactics of a corrupt railroad company. It is a masterpiece that definitely belongs on any list of the twenty best novels in American literature, if not the top ten. Norris’s other famous novel is McTeague, the story of a mild-mannered dentist and his wife whose lives are gradually destroyed by an all-consuming greed. Part suspenseful thriller, part insightful psychological study; it makes for a gripping read. As for the third novel, the obvious choice would have been to include The Pit, a sequel of sorts to The Octopus, and probably Norris’s third best-known work. Instead, the editor chose to include Vandover and the Brute, Norris’s first novel, which did not see publication until after his death. It depicts the descent of a young artist into a life of decadence and vice. In terms of quality, it’s not in the same league with the other two novels, but it reveals a promising stage in the development of his mature style, a glimmering of great things to come. This volume includes 22 of Norris’s essays. All are about four or five pages long, all pertain to writers and writing, and all are excellent. In these essays Norris defines his conception of naturalism, outlines the responsibilities of the novelist, and reveals his vision of the future of American literature. He issues a call to arms to American writers to step up and create the great epic of the American West. Though adept at serious literary criticism, Norris also had a sense of humor, as evidenced by “Perverted Tales,” a hilarious piece in which he parodies the writing styles of Rudyard Kipling, Stephen Crane, Bret Harte, Richard Harding Davis, Ambrose Bierce, and Anthony Hope. The editor of this volume, Donald Pizer, has done an excellent job of selecting essays that give us a clear and thorough insight into the mind, personality, and literary thought of this great author. I can’t say enough good things about the Library of America. Although I love my Kindle, when I really want to get to know an American author, I’m happy to leave the e-reader at home and lug around one of these big, beautiful hardcover volumes. The LOA produces books that are superbly edited, elegantly designed, and handsomely and durably constructed. They are cherished items on my book shelves, and I hope some day my grand kids will read them. Originally published in 1830, Gobseck is among the earliest handful of works to be included in Balzac’s magnum opus La Comédie Humaine, a collection of over 90 novels and stories in which he attempts to depict all the myriad aspects of French society. This novella contains many of the same characters that feature in his novel Père Goriot. Though that masterpiece was published five years later than Gobseck, the two works must have been conceived somewhat simultaneously, as their stories are intricately interwoven. That said, one need not have read one in order to enjoy the other, and even those with no knowledge of Père Goriot can still appreciate Gobseck. Late one evening in the salon of the Vicomtesse de Grandlieu, the conversation turns to the discussion of a young man, Ernest de Restaud, for whom the Vicomtesse’s niece Camille bears some romantic feelings. A guest and friend of the family, the attorney Monsieur Derville, shares a story from his past which he claims relates to the young man. The connection is not readily apparent, however, as the story he tells is primarily concerned with a former neighbor of his, the moneylender Jean-Esther van Gobseck. “Daddy Gobseck,” as he is sometimes affectionately called, is an aged man of action with a mysterious past whose entire existence and personal philosophy revolves around the acquisition of wealth. He craves money not for the things it will buy him, but for the effect it gives him over people’s lives. He considers himself and a small group of his professional colleagues to be the ten most powerful men in Paris. As people of all walks of life come crawling to him, begging for loans at usurious rates, their personal dramas become to Gobseck what the theatre is for art lovers. He is a connoisseur of desperation. Derville develops a social relationship with his neighbor, but eventually must consult the moneylender on a matter of business. From that point on he becomes Gobseck’s legal advisor and bears witness to many of the old man’s dealings. When Anastasie de Restaud, the daughter of Père Goriot, consults the usurer in hopes of concealing from her husband the fortune that she has wasted on her lover, the real drama of the story begins. The novella starts out auspiciously enough. Balzac’s character sketch of Gobseck is remarkably vivid and absolutely fascinating. The book takes a turn for the worse, however, the deeper it delves into the affairs of Madame de Restaud. The dramatic events that lead the characters to seek out the moneylender are riveting. The mathematics of their business transactions, on the other hand, often dull the emotional impact of the plot. In Gobseck, as in other of his works, Balzac demonstrates his fascination with legal proceedings. He delights in the mechanics of wills, deeds, writs, and contracts—a proclivity that this reader, for one, does not share. Were it not for the tedium and confusion inspired by so much clerical detail, Gobseck would likely be every bit as strong as Père Goriot. If you haven’t already read Père Goriot I would strongly suggest you do so, not because it’s a prerequisite for reading this book, but simply because it's Balzac’s greatest work. If you enjoyed that excellent novel, then you will probably find much to appreciate in Gobseck as well. Despite the preoccupation with legal matters in its latter half, Gobseck is still a very good story overall, and Balzac has endowed it with a few truly unforgettable scenes. The singular title character alone makes it well worth the reading. Selected Polish Tales by Boleslaw Prus, et al. In 1915 and 1916, translator and editor Else C. M. Benecke published two collections of short stories and novellas entitled Tales by Polish Authors and More Tales by Polish Authors. She was working on a third collection at the time of her death. Completed by her colleague Marie Busch, this volume was published in 1921 under the title Selected Polish Tales. Perhaps the posthumous completion of the book explains why it feels like a collection of leftovers. Compared to the two volumes that proceeded it, this third collection is a disappointment. Two-thirds of the volume is taken up by a complete novel, The Outpost by Boleslaw Prus. Though Prus is one of Poland’s most renowned authors, this is not his best work. Originally published in 1886, it tells the story of Josef Slimak, a gospodarz, or peasant landowner. Slimak embodies the peasantry’s admirable work ethic but also their ignorance and resistance to change. At first the book seems like it’s going to be about the interaction between the different social strata of Polish society. Then it becomes a tale of conflict between Slimak and some German colonists. Then a series of tragedies befalls Slimak. At first, these hardships are clearly the consequences of his poor decisions. Later in the book, however, Slimak suffers a number of essentially random catastrophes, and the book devolves from a tragedy into a miserable tale of woe. Though the novel offers some interesting perspective on Poland’s socioeconomic history, the story is relentlessly slow, and the unsatisfying ending leaves the reader with a feeling of pointlessness. Nobel laureate Wladyslaw Reymont has two pieces in this book. In the preface, Busch says they are excerpts from his novel The Peasants. Having read The Peasants, however, I know that to be incorrect. They are obviously excerpts from some larger work, however, for they feel incomplete and out of context. The one entitled “Death” is a particularly fruitless meditation on misery, in which a dying man is abused by his daughter because he has disinherited her. It’s possible these selections come from great novels, but as presented here they fail to adequately represent Reymont’s formidable talents. There are a couple of bright spots amidst this otherwise gray collection. Adam Szymanski’s “A Pinch of Salt” is set in Siberia among the Polish dissidents who have been exiled there. This story is the closest thing to lighthearted and touching that can be found in this otherwise bleak collection, and it even finishes off with a satisfying bit of a surprise ending. In the bleak category, the strongest piece is “The Sentence” by Juliusz Kaden-Bandrowski. Set in World War I, it relates the story of a cold and starving old man whose cottage is encroached upon by a threatening band of Cossack soldiers. It is an emotionally powerful story that moves in some unexpected directions. The absolute worst selection in the book is “P.P.C.” by Madame Rygier-Nalkowska, set in the early days of World War I. The resolution of the story hinges upon the abbreviation in the title, yet nowhere is it explained what these three letters stand for. While there are some excellent authors included here, for the most part this collection doesn’t do justice to them. Rather than reading Selected Polish Tales, seek out the previous two volumes in this series, which are far superior to this one. If you liked this review, please follow the link to Amazon.com and give me a “helpful” vote. Thank you. In the year 2073, a feeble old man squats beside a campfire and imparts to his grandsons the oral history of their ancestors. They know him only as “Granser,” but in 2013 he was James Howard Smith, professor of literature at the University of California. That was the year the scarlet death swept through the world, nearly wiping humanity off the face of the planet. Only a few survivors remained to eke out a primitive existence and begin the construction of a new civilization. Though best known for his wilderness adventure stories, Jack London was also one of America’s first great science fiction writers. The future of The Scarlet Plague bears some resemblance to the dystopian vision of London’s great novel The Iron Heel, a work far superior to this one. In both books, America is subjected to the iron rule of an oligarchy of wealthy capitalists. In The Scarlet Plague, disease is the great leveler of class. After the red death wipes away human civilization, what remains is a primeval world where strength triumphs over wealth, brutality over culture, and ignorance over education. This is a rather short novel; it could have been much more compelling had it been fleshed out a little more. As it stands, the two narratives (2013 and 2073) compete with each other for space so that neither is fully developed. Despite touching on issues of class, the main purpose of The Scarlet Plague is entertainment, not education. Though it’s definitely not what you would call feel-good entertainment, it has the feeling of a modern-day post-apocalyptic sci-fi B-movie. There are evil characters that act in their self-interest, and noble characters that act for the good of humanity. Tearful goodbyes are said to perishing loved ones, and harsh conditions bring love to strange bedfellows. Regrettably, it’s impossible for a 21st century audience who has developed an immunity to such cinematic conventions to fully appreciate how truly shocking and ground breaking this novel must have been to the original audience of 1912. If you enjoy London’s sci-fi writings you’ll find much to like in The Scarlet Plague, but don’t read it unless you’ve already read The Iron Heel. Unlike the books for which Jules Verne is famous, Michael Strogoff, first published in 1876, is not a visionary science fiction novel but a classic romantic adventure. The title character is a courier for the Czar of Russia. A Tartar rebellion has arisen in Siberia, cutting off telegraph communication to much of the eastern frontier and leaving the Czar’s brother, the Grand Duke, isolated in the eastern city of Irkutsk. The Czar commissions Michael to travel to Irkutsk to deliver a message of vital importance. The journey of over 2,500 miles will take him through territory occupied by the Tartar hordes, therefore he must conceal his identity by masquerading as a merchant. Soon after his departure he meets a young woman who is traveling alone to Irkutsk to reunite with her father, a political exile. Out of a gentlemanly concern for the young lady, and partly to reinforce his cover, Michael suggests to her that they make the journey together as brother and sister. Together the two travelers, Michael and Nadia, embark on an epic adventure fraught with peril. The year of the tale is unspecified, yet one can assume it was intended to take place around the time it was written. The Tartar rebellion described in the story is entirely fictional. Nevertheless, Verne puts a great deal of effort into verisimilitude by providing detailed depictions of Russia and Siberia. He minutely describes every region and town along the road—its topography, its citizenry, its soil and vegetation, and its main exports. Far from becoming tedious, this National Geographic-like attention to detail really elevates this adventure above others of its genre by vibrantly bringing this remote and exotic country to life. It seems obvious to the reader that Verne has traveled this road, all the while taking copious notes of the sights and sounds of his journey, yet Wikipedia states that he never actually travelled there, and his information comes entirely from second-hand research. The setting and the epic tone of the story call to mind the great Polish historical trilogy by Henryk Sienkiewicz, which largely takes place on the Ukrainian steppe. As Michael navigates through enemy territory, the book also reads as a sort of 19th-century James Bond story. In keeping with his times, however, Strogoff is much more of a Boy Scout than Bond. At times the saintliness of Michael and Nadia becomes a bit cloying, and Michael’s relentlessly noble and virtuous nature comes across as too superhuman. The story is a little predictable at first, not in an unsatisfying way, but in the way that most Hollywood adventure stories are predictable. Then, about two-thirds of the way through, something happens that I did not see coming at all. This unexpected event brings a truly original slant to the story and really separates this tale from countless other adventure narratives. At certain points in the book things take place that defy believability, but this is Jules Verne after all; it ain’t Tolstoy. These transgressions are to be forgiven once things are wrapped up in the final chapter, and all is explained to the reader’s satisfaction. My previous experience with Jules Verne consists solely of reading Twenty Thousand Leagues Under the Sea. Like most readers, I suspect, I had no idea that Verne wrote this kind of romantic historical adventure story. Now that I know, I plan to seek out more of his writings. Michael Strogoff is not a masterpiece, but it is a solid, enjoyable read for enthusiasts of classic adventure fiction. First published in 1919, Winesburg, Ohio is a collection of 22 interrelated stories set in a fictional small town in the American Midwest. Though each story can stand alone as an individual work, they are so closely interwoven that some consider the book to be a novel. The protagonist of each story often makes a supporting appearance in the tale of his or her neighbor, relative, friend, or lover, while dozens of other characters are encountered only in brief cameos. George Willard, a young reporter for the local newspaper, appears in almost all the stories and unifies the various tales into a cohesive book. Everyone in town seems to consider him a kindred spirit, and they seek him out, asking him to serve as their confessor, chronicler, and/or psychiatrist. In deceptively simple prose, Anderson vividly captures the everyday life of this small Ohio town during its period of transition from agrarianism to modern industrialization. The denizens of Winesburg struggle to find their place in this microcosm of modern society. Their sensitive souls are tormented by loneliness, isolation, guilt-ridden pasts, frustrated dreams, and a stifling ability to communicate their feelings and aspirations. Sinclair Lewis’s novel Main Street, published about the same time and also focusing on a Midwestern town, features an ambitious dreamer, Carrie Meeber, who envisions herself a prisoner within a conservative small town full of narrow minded bumpkins. In Winesburg, Ohio, everyone is Carrie Meeber. Everyone is a prisoner to something, and everyone wants out. For many of the characters, the big city represents salvation, as if their problems would just go away if they could escape to Cleveland, Cincinnati, or Chicago. More often than not, that salvation proves false and they return to Winesburg defeated. Having grown up in a small Midwestern town myself, I can say that much of Anderson’s portrayal of small town life rings true. It’s unclear, however, whether he’s proposing that the emotional turmoil and alienation felt by Winesburg’s residents is peculiar to the experience of small town life or merely indicative of the world at large. Winesburg, Ohio is one of America’s earliest examples of modernist literature. Its influence on later modernist writers is readily apparent, most notably in the works of William Faulkner. While Anderson possesses a brilliant insight into human thought and emotion and expresses his vision in a beautiful narrative voice, most of the stories end all too abruptly and thus feel incomplete. It’s a conceit of modernism to think that it’s enough for the author to merely offer sketches of the way things are, without providing the reader with a satisfying beginning-middle-end plot structure. In most of these stories we’re deprived of an end, and one finishes each tale with the disappointment of having just read two-thirds of a novel, only to find the succeeding pages missing. The characters all finish their stories as if frozen in some tableau vivant. Reading Winesburg, Ohio is much like wandering through a gallery of Edward Hopper paintings. You’ve got a pretty good idea where these people have been, but you don’t have a clue where they’re going. Originally published in 1896, Rome is the second volume in the Three Cities trilogy by French novelist Emile Zola, the first and final volumes being Lourdes and Paris, respectively. In this trilogy Zola delves into the history and politics of the Catholic church. The protagonist of all three novels is Abbé Pierre Froment. In Lourdes Pierre seemed in danger of losing his faith, but Rome opens with the young priest experiencing a newfound fervor toward his calling. He has spent the last few years working to aid the poor, and has developed an enthusiasm for the concept of Christian socialism. He believes the Catholic church should focus less on acquiring wealth and political influence and concentrate more on alleviating human suffering and fostering brotherhood among mankind. He writes a book on the subject, in which he advocates a reversion by the church to the principles and practices of its primitive apostolic origins. His book is denounced by the Congregation of the Index, a committee of Vatican officials who compile a blacklist of books deemed dangerous to the church. Pierre travels to Rome to defend his book, hoping for an audience with the Pope himself. There he lodges with the Boccanera family, a formerly great and influential house that, like many of Rome’s aristocracy, has recently fallen on hard times. While maneuvering through the Vatican bureaucracy in an attempt to save his beloved book, Pierre becomes involved in the romantic and political dramas of his host family. The story takes place in the late 19th century, shortly after Italy has gained its independence and absorbed the former Papal States. Zola repeatedly contrasts the former glory of Imperial Rome with the city’s present state of financial ruin and decay. The populace of Rome is split between two factions, the “black” and the “white”—those faithful to the Vatican and those loyal to the new Italian government. The church in turn is divided among those who adamantly cling to time-honored dogma and those who think the church must make concessions and broaden its appeal in order to survive in the modern world. Zola, ever the skeptic, inquires whether religion even has a place in the modern world, given the triumphs of science over superstition. This is an ambitious work full of big philosophical ideas, and for that it is to be admired. Yet one wishes there were more of a novel here. Despite a few memorable scenes, there just isn’t enough story. In Rome, Zola is guilty of many of the same sins he committed in Lourdes. The first half the book is primarily a travelogue, with extremely detailed descriptions of the Roman skyline from various vantage points, accompanied by historical commentary. Meanwhile, Pierre makes little progress in his quest for a hearing, and the reader must endure a lengthy succession of fruitless meetings with various Cardinals, priests, and prelates, many of whom are indistinguishable from one another. In the second half the characters actually begin to develop, and the reader is treated to some suspenseful intrigue, but the plot is soon overcome by Pierre’s internal philosophical dialogue, which reads like a series of essays espousing Zola’s views on the church. The book’s saving grace is that Zola actually has some interesting ideas on the subject. Nevertheless, it takes a particular type of reader to appreciate the Three Cities trilogy. On the one hand, you must have some interest in the history and philosophy of religion. On the other hand, Zola’s perspective is ultimately anti-religious, and will appeal mostly to non-believers. For those willing to walk that tightrope, don’t dive into Rome unless you’ve already tackled Lourdes and found it to your liking. Lynd Ward was an artist and book illustrator who is indisputably the American master of the woodcut novel. By combining wood engravings into sequential narratives, he created wordless literary masterpieces—most notably the novels God’s Man, Madman’s Drum, and Wild Pilgrimage—which were influential precursors to today's graphic novels. The two pieces contained in this 2010 edition from Dover Publications, Prelude to a Million Years and Song Without Words, could be considered graphic short stories. The former, originally published in 1933, is comprised of thirty images, and the latter, from 1936, of twenty-one. Though these brief works are less monumental achievements than his lengthier novels, the shorter format proves to have been somewhat liberating for Ward. In these two works he seems less beholden to narrative conventions than usual, and more willing to experiment with abstract, symbolic imagery. Of the two pieces included here, Prelude to a Million Years has the more concrete narrative structure. It tells the story of an artist who worships beauty, yet nonetheless must deal with the ugly reality of the world in which he lives. When not engaged in the act of artistic creation, he navigates a bleak cityscape, bearing witness to domestic violence, labor unrest, and the rampant jingoism preceding the Second World War. Song Without Words illustrates the fears of an expectant mother as she contemplates giving birth to her child in a world threatened by the spectres of Fascism, Nazism, and imminent war. This piece has less of a straightforward linear narrative than one usually finds in Ward’s wordless novels. It reads more like a portfolio of trippy, dreamlike visions, often employing surrealistic imagery. It contains some of the most shocking and powerful images Ward ever created, some of which rival the creepiest creations of Salvador Dali. The book features a very good introduction by David A. Beronä, a respected historian of woodcut novels. In addition to some brief interpretation of the works, Beronä offers interesting historical information about the creation and publication of the original editions. Unfortunately, this introduction is only four pages long and leaves the reader wanting more. Dover, a publisher known for their inexpensive reissues of classic works, is to be commended for bringing these works back to life, but the reproduction quality of the illustrations is merely adequate. The book is printed on a smooth matte-coated sheet which allows for the preservation of Ward’s intricate line work, but robs the illustrations of the rich blacks and tonal depth that would have resulted from a softer, uncoated sheet. True fans of Ward’s work should splurge on the Library of America’s two-volume hardcover edition of his complete woodcut novels. Overall the price would probably be cheaper than that of collecting all the individual Dover editions. Those not ready to make such a big commitment to Ward’s work, however, can’t really go wrong by buying this inexpensive edition. These beautiful and moving works are well worth the price. 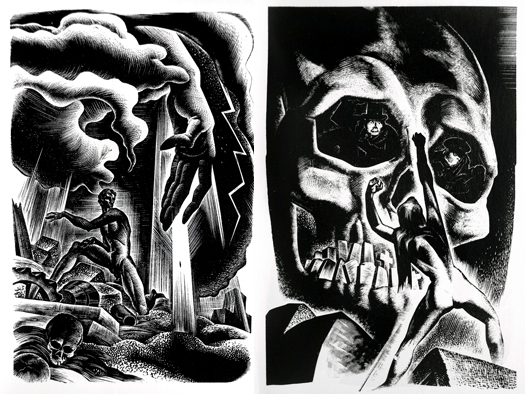 Left: Lynd Ward, from Prelude to a Million Years, 1933. Right: Lynd Ward, from Song Without Words, 1936.